Evidence-based education is an attempt to find, critique and implement the highest quality research evidence that underpins the education provided to students. 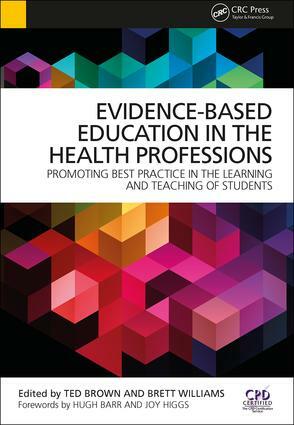 This comprehensive book presents concepts key to evidence-based education, learning and teaching, analysing a wide range of allied health professions in depth. It introduces unique, inspirational practice models, ideal for practical application, and highlights ways in which healthcare educators can make use of existing education-related research to improve their teaching and also generate learning environments to promote optimal student experiences. Whilst fostering knowledge and understanding between various health professions, it also improves student outcomes and increases student satisfaction. This edited text is an invaluable resource for healthcare professionals along with experienced clinical and university-based educators such as practice education supervisors, academic educators, educational researchers and doctoral students in a range of areas including nursing, midwifery, physiotherapy, radiography, occupational therapy, speech therapy, audiology, paramedics, nutrition and dietetics, and pharmacy who want to ensure their teaching and learning strategies are underpinned by sound empirical evidence.